The patented Ohr Pharmaceutical Inc. sustained release technology employs a hydrogel template approach to prepare microparticles or other configurations of predeﬁned size and shape with very homogeneous size distribution. The drug release characteristics of the particles can be adjusted, providing ﬂexibility in controlling release rates in our drug delivery formulations. The drug loading (content) capacity of Ohr’s technology is much higher than that achieved by conventional methods and our approach allows for control of the initial release (burst) of drug. 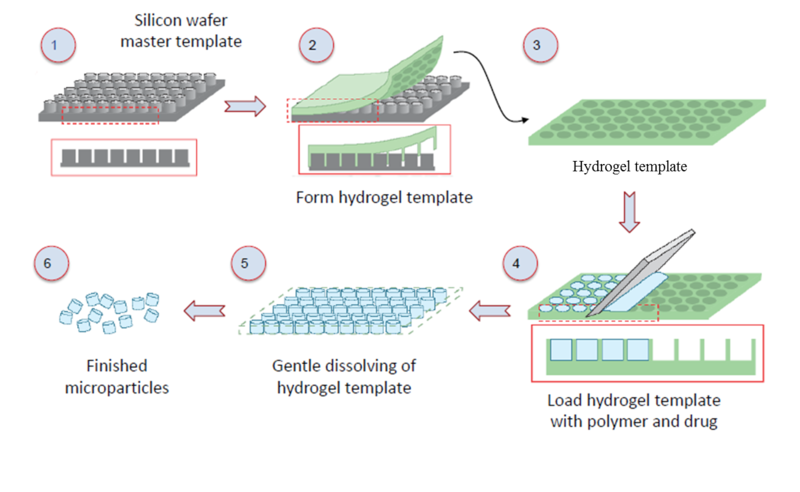 Simplicity in processing makes the hydrogel template method useful for scale-up manufacturing of these sustained release particles. The Ohr sustained release technology is compatible with hydrophilic or hydrophobic drugs, fragile biologics and can incorporate any biodegradable polymer. Drug delivery can be achieved both outside the eye (e.g. subconjunctival space) as well through intravitreal administration using a standard needle. Our programs aim to markedly enhance patient compliance, reduce treatment burden and improve visual outcomes in a number of ocular conditions including primary open angle glaucoma, steroid-induced glaucoma, ocular allergy, and retinal diseases.